On April 25, 1999, over 10,000 practitioners demonstrated on Fuyou Street outside of the Zhongnanhai compound, asking that the law recognize their legal right to practice and that the practitioners detained by the Tianjn police department be released. The practitioners left peacefully after then-Chinese Premier Zhu Rongji met with their representatives, and agreed to release the Tianjin practitioners and assured the representatives that the government did not oppose Falun Gong. 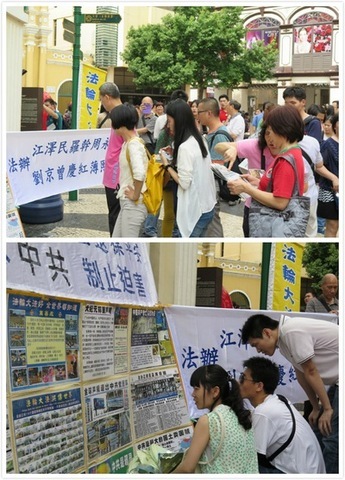 The set-up and banners prompted many Chinese tourists to take pictures. 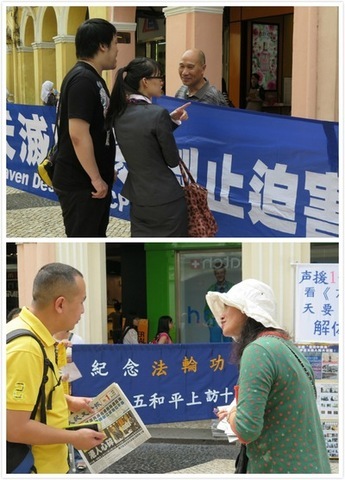 Two young men from Dongguan City, Guangdong Province, said, “We cannot get information like this in the mainland.” After reading the poster about the April 25, 1999, peaceful appeal and learning the facts about the persecution, they quit the Communist Youth League and took software to circumvent the Internet censorship and get more information later. 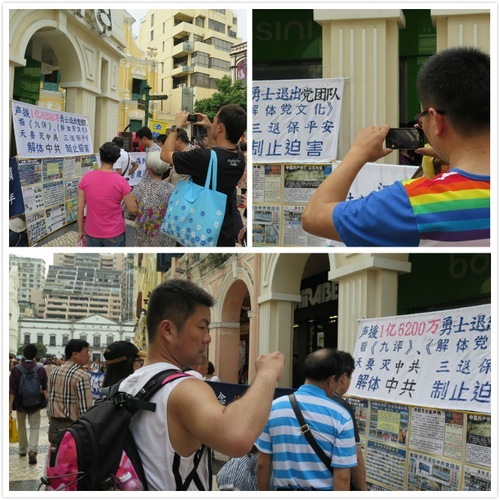 A young girl from Zhuhai City, Guangdong Province, took many pictures of the posters. She said, “Macao is good - there is more freedom here.” She renounced her membership in the Youth League. Over 200 Chinese tourists quit the Chinese Communist Party (CCP) and its affiliated organizations during the afternoon. Many took materials. Every year, practitioners all over the world hold different events to commemorate the anniversary of April 25th. 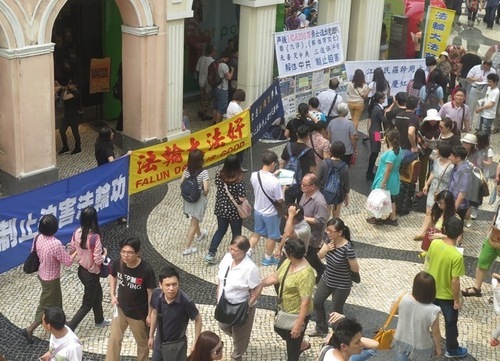 They have peacefully resisted the violent persecution over the past 15 years, and the historical significance of the April 25th appeal, which first focused international attention on Falun Gong, continues to grow.